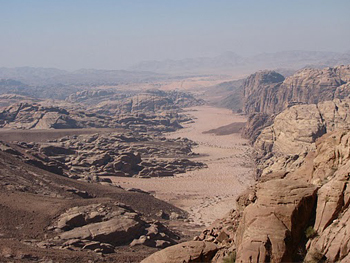 From Wadi Rum , we will drive you through the desert some 40kms to the south to Jebel Um Addami. This is a magnificent drive through the far valleys of Wadi Rum and crossing the beautiful and lonely Wadi Saabit. Upon arrival you will have a guided hike to the top which usually takes about 2 1/2 hours. You'll hike up Jabal Um Addami and then after resting at the top, you'll descend to a nice secluded area. While you rest and explore the area, your guide will start cooking your lunch. After the lunch you can hike for 2 hours and then we drive you by jeep to the Bedouin Lifestyle Camp where you can watch the beautiful sunset and spend the night while enjoying music, songs, a delicious bedouin dinner and bedouin tea.